At the company’s Ignite conference in Orlando this week, Microsoft officially announced the upcoming Surface Pro flagship tablet PC with support for 4G LTE cellular connectivity, using the same networks that power today’s most popular smartphones. Shipping on December 1st, the Surface Pro LTE will bring always-on connectivity support to the Surface for the first time in several generations, with upgraded software support and improved connection speeds. By integrating LTE wireless technology in the company’s flagship compute device, Microsoft is sending a message to its partners that it views the future of mobile computing as always-connected. How aggressively other OEMs follow suit, and how carriers like AT&T and Verizon handle data usage increases, will ultimately determine how fast this transition takes place. Microsoft’s move into 4G LTE connected tablets and notebooks validates the market’s directional shift towards a more connected and always-on design mentality. Until recently, only enterprise and low volume notebooks from Lenovo and other business-centric OEMs offered cellular connectivity. But modern consumers are expecting computing environments that are more like their smartphones than traditional PCs. That means instant wake up, all-day battery life, and connectivity that doesn’t require hunting for hotspots and passwords. 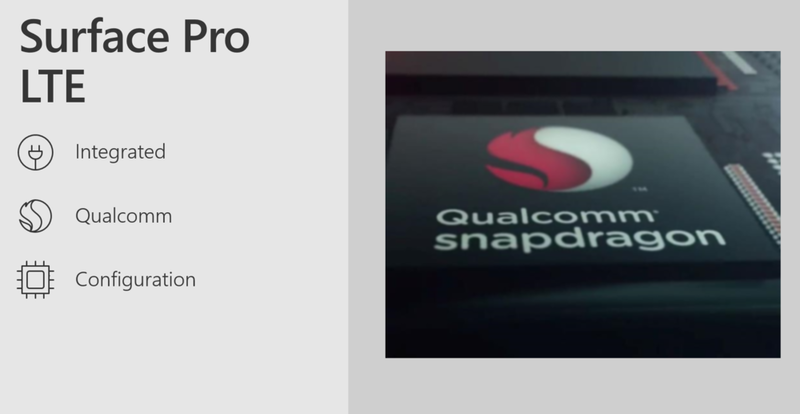 This Surface Pro with LTE will be a direct competitor to the upcoming Qualcomm Snapdragon based Windows 10 machines that Microsoft and Qualcomm have partnered on. The Snapdragon platform integrates the same Gigabit class LTE cellular modem universally and should offer battery life advantages over the Intel Core-series processors as Snapdragon is designed from day one to operate in lower power states typical of smartphones. For Windows, a device that is constantly connected to a network even in sleep states is an under developed market. Advantages of the always-connected capability bring the features of your smartphone to your laptop. That includes notifications, immediate availability of emails, and instant wake times. 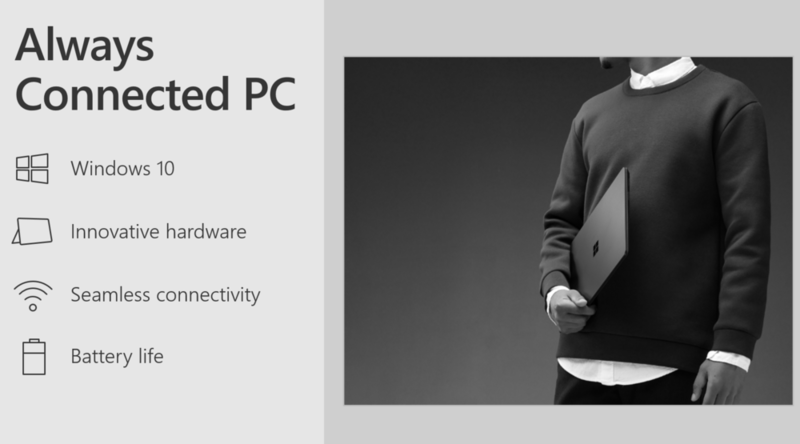 Microsoft claims that sleep and hibernate have been optimized to be more efficient when connected to 4G LTE, allowing the upcoming Surface Pro LTE to remain connected even when in a lower power state. This increases battery life of this “always connected” state. Microsoft says that a Surface Pro connected to LTE exclusively will see approximately 90% of the battery life of one using Wi-Fi only. Carrier support is expected in the US, Canada, Australia, China, Japan, and most of western Europe. Other parts of the world will depend on roaming support for cellular connectivity. For the LTE modem integration, Microsoft chose to use the latest Snapdragon X16 option from Qualcomm that offers performance as high as 1 Gigabit per second, as fast as Google Fiber. The modem is directly integrated on the mainboard of the system, lowering costs and improving space and power efficiency. Microsoft will support eSIM technology that allows enterprise and end users to dynamically assign and provision data support without requiring physical SIM cards or visits to cellular provider stores. Though details are still filtering out, it seems likely that the Surface Pro LTE will limit connectivity speeds to 450 Mbps, well under what the Qualcomm modem is capable of hitting. This could be an issue of integration and design time, but it does mean that peak performance and maximum range of connectivity will be limited. This is a similar integration decision to what we found the new iPhone 8 and iPhone X modem. Microsoft’s decision to use a Qualcomm modem in a system that is otherwise powered by Intel processor and graphics technology is telling of the current state of connectivity technology. Qualcomm’s ability to build the best performing modems gives it advantages that help it find its way into systems that might otherwise go to different solutions providers. The iPhone 8/X integration and this Surface Pro LTE design win are both at the expense of Intel’s play into connectivity.